This side dish can be found at any typical Puertorrican “fonda” or dive. 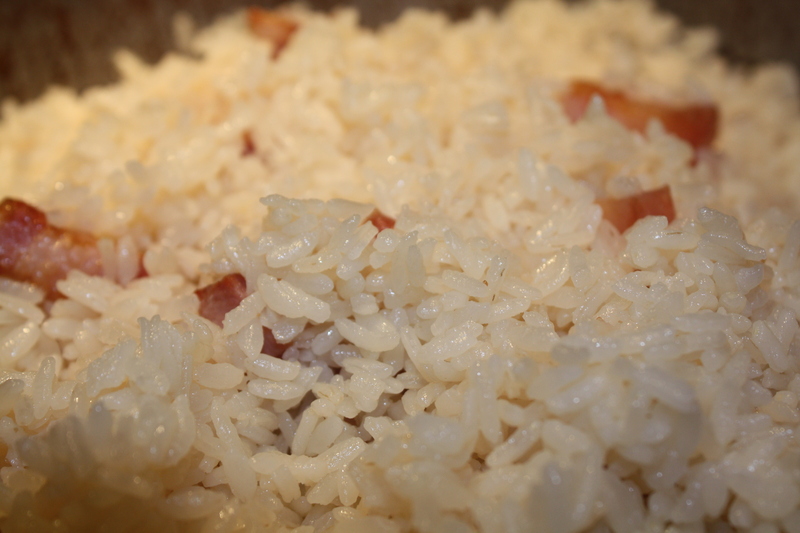 Arroz con tocino (I like to add the “tocino” for the flavor but don’t eat it) is simply medium grain white rice with salt pork. 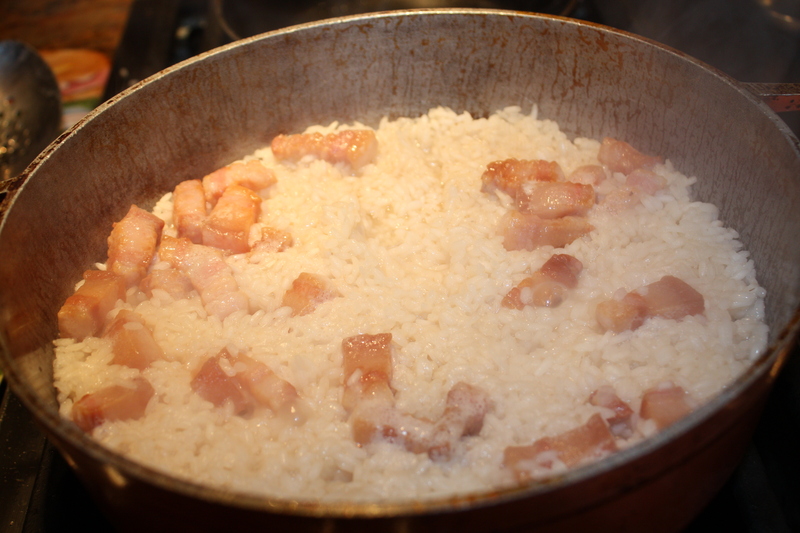 The salt pork or “tocino” (I use Hormel brand because it is not as salty and its marbled like bacon) gives the white rice additional flavor and its fat allows for the perfect setting to make crispy “pegao” (crusty rice at the bottom of the pan seen in the following picture). 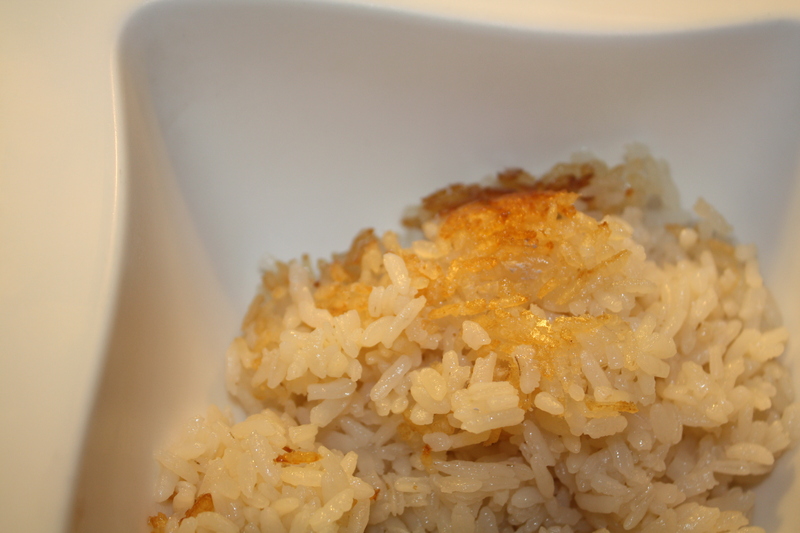 Other countries make similar crusty rice like in the Dominican Republic in which they call it “con-con” or the persians which have different versions of rice called “polo” and also make crusty rice at the bottom. Serve with “lechón asado”, “pasteles”, “carne guisada”, or “fricasé de pollo” and top with “habichuelas guisadas” with a side of “tostones” and a slice of avocado and you have an example of what many people in Puerto Rico like to have for lunch or dinner. I know its a lot of food and unhealthy if eaten everyday in large quantities, but believe me, having “arroz con tocino” with stewed beans once in a while is very satisfying. 1. 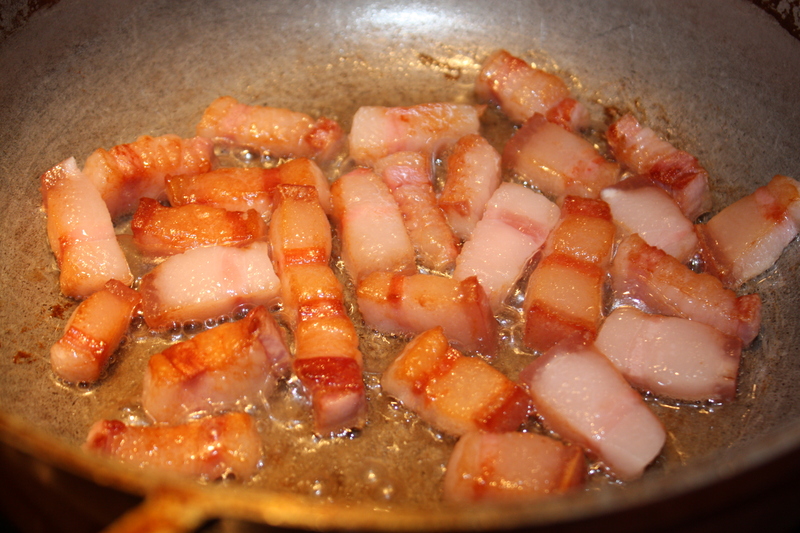 In a medium “caldero” heavy bottomed saucepan, sauté salt pork until golden brown for about 8 minutes over medium heat. Stir occationally. 3. Add water and salt and let water evaporate completely. gracias haydee por tus tips. tu eres una experta en la cocina!